This apartment is located on the ground floor in a beautiful holiday complex in Hamburg Marienthal, embedded from the Wandsbeker woods. In addition to two bedrooms each with 2 box spring beds and direct access to the respective terraces, the apartment has a large living room with dining area and open kitchen, incl. GS and a large bathroom with 2 sinks, toilet and large shower. The shopping street Wandsbeker market can be reached in 3 minutes. Here you will find the subway station and the bus station and numerous shops, coffee's, restaurants and shopping u. A. The mall Quarree. Doctors and the hospital are also nearby. The apartment has been restored and beautifully appointed. Arrival and meeting with pleasant greeter was great and informative. Communication with owner and caretaker was simple... The Apt. was everything as stated, and fit our needs to perfection. Location is close to all shopping needs and also to public transportation. Exceptionally modern and clean.. Could not have been better accommodations for two couples and we would definitely stay here again.. 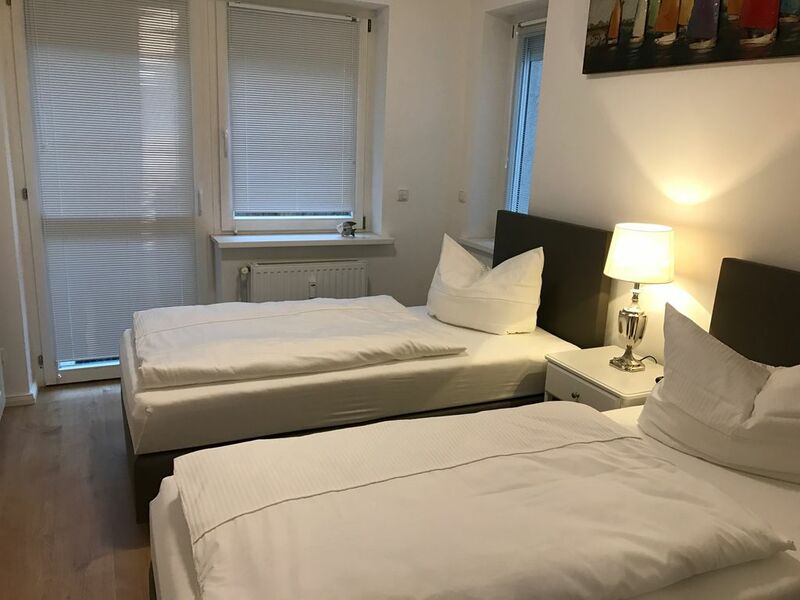 Very well located appartment near to public transport for easy and quick travel to the centre of Hamburg and with local shops and restaurants. The appartment was clean and very comfortable, with everything we needed. WiFi was good so it was easy to check all the places we wanted to visit. We did not drive to Hamburg but parking did not look as if it would be difficult. If using public transport, I recommend buying the Hamburg Card which covers all public transport, including travel to and from the airport and also the public ferries. When we opened the front door we were pleasantly surprised to see a rather stylish and well decorated apartment; loved the art on the walls. The apartment was very clean, the beds were comfortable and the bathroom was perfect for all of us, especially for my wife and two teenage daughters. They were able to use the long mirror at the same time to put on their make-up and the shower was difficult to separate from once you were under it, especially after a long day of walking around the city. So we highly recommend this apartment and would certainly rent it again if we returned to hamburg. The apartment was very nice overall. Very clean. Very nice bathroom. Bedrooms were small and tight but adequate. Location was ideal, just a few minutes walk to the U station. Parking was very easy. It was very warm when we were there and the apartment felt very stuffy, though it was not damp or musty. It would have been really nice to have a few fans. Host was very pleasant and met us promptly on our arrival. well appointed ground floor flat. Very nice wooded area close to shops and shopping mall. Would highly recommend this property for facilities, cleanliness and a 9 minute RB train ride to Hamburg Central station. Property located in quiet wooded area. Für bis zu 4 Personen absolut passend, tolles Bad und sehr gut an die öffentlichen Verkehrsmittel angeschlossen. Wandsbek Markt 5 Laufminuten entfernt.